or they are interested in membership. Reserve the date on the church calendar before other arrangements are made. Contact Pastor for premarital education and counseling sessions at least 16 weeks in advance of the wedding date. 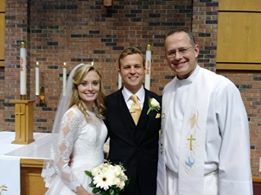 Weddings are worship services, as such the pastor must approve the liturgy, music, and vows in the service itself. Please see the Wedding Manual for more information.